I have a confession to make. I have always had a weakness for dip made with packaged onion-soup mix. When I was little and my mother made it (very occasionally, I must add) it seemed like a miracle that all that flavor could come out of one small package stirred into some sour cream. As a grownup I’m more skeptical about packaged foods than I was as a child, when they were a novelty. And I have to shudder when I read the side of an onion-soup package. I don’t really think a creamy dip needs things like partially hydrogenated soybean oil, caramel color, corn syrup, and disodium inosinate. I don’t know what that last item is—and neither does my computer’s spelling program—but I’m pretty sure it’s not what one could call a food, let alone a healthy food. I do still love onion dip, however. And it’s an easy, tasty snack for the Big Game—or the “Superb Owl,” as The Colbert Report calls it since the NFL threatens to sue anyone else who uses the official terminology. As this football event approaches I am concocting a more natural version of my childhood guilty pleasure. This dip starts with the base my mother used for her cordon bleu French onion soup—caramelized onions, mustard, and wine. She used red wine, but I was darned if I was going to open a bottle of wine for the minuscule amount I wanted so I used sherry. If you feel like drinking red wine, by all means substitute it for the sherry. I can see adding additional ingredients another time—a little Creole seasoning for kick, some herbs (parsley? dill? thyme? ), and/or a few drops of Worcestershire sauce. On Sunday as I watch the Broncos and the Seahawks battle it out, however, I plan to serve it just as it is below. This onion-dip recipe takes a little more time than the package-based version, but it’s by no means difficult. The resulting spread tastes fresh yet mellow, and highly satisfying—like French onion soup on a chip. It tastes best with homemade vegetable chips. 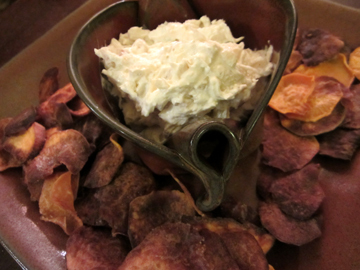 We made sweet-potato chips yesterday. I won’t tell the Culinary Recording Angel if you go out and buy some, however. 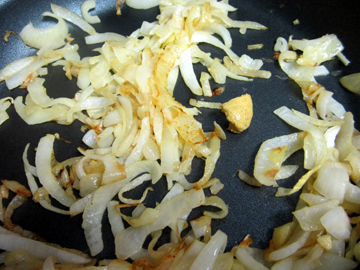 Mustard is added to caramelizing onions. The dip is best prepared early in the day or the night before you wish to serve it. It needs time in the refrigerator to let its flavors blend and mature. Combine the butter and olive oil in a nonstick skillet over medium-low heat. When the butter melts stir in the onion slices. Cook them slowly, stirring every 5 minutes or so, until they are reduced and turn a lovely golden brown. This will take at least 1/2 hour and may take as long as an hour. When the onions are almost ready stir in the mustard, and continue to cook, stirring, for at least five minutes. Add the sherry and cook, stirring, until the liquid disappears. Sprinkle salt and pepper over the onions and remove them from the heat. Allow them to cool to room temperature. If you want to avoid having strings of onion in your dip, chop them a bit once they have cooled. Put the onions and sour cream in the bowl of an electric mixer and stir briskly to combine. Place the dip in the refrigerator, covered, and let the flavors combine for several hours. At least an hour before serving taste it on a neutral cracker to see whether you want to add any additional flavors (more salt and pepper perhaps?). 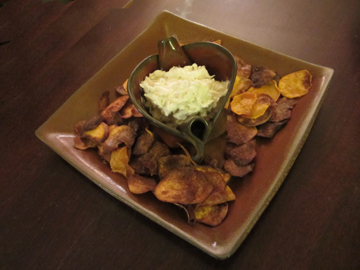 Bring the dip to room temperature, and serve it with vegetable chips. My sister-in-law Leigh and I actually made two kinds of chips to go with our test dip—one batch fried and one batch baked. HOWEVER, I’m only giving you the recipe for the fried batch because we were so busy eating the fried chips (they were AWFULLY tasty) that I forgot to time the baked ones. They are obviously healthier than the fried version. I’ll tell you how we did the baked ones, but I won’t officially publish the recipe until I make them again! Basically, one slices the sweet potatoes just as one does below for the fried chips. One combines extra-virgin olive oil (about 1 tablespoon) and sea salt (about 1/2 teaspoon) in a bowl; then one stirs in the slices of sweet potato until all are coated with a tiny bit of oil. The slices go on cookie sheets in a preheated oven (325-ish) until they finish cooking; I THINK this is about half an hour. One should stir/turn the potatoes after 10 minutes and check on them frequently. Now for the FRIED version. 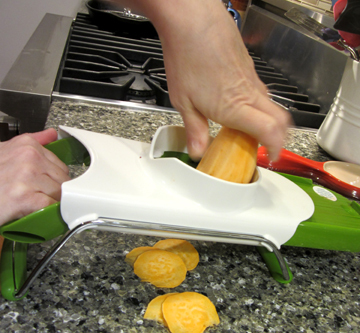 Leigh has a mandoline slicer, which made creating the chips a breeze. I got the idea for cold-oil frying the chips from my friend Devany Vickery-Davidson in Charleston, South Carolina. Apparently, cold-oil frying is very chic, but I had never heard of it until Devany wrote about making French fries this way. It is less messy than hot-oil frying and a lot simpler. Leigh works her mandoline magic. 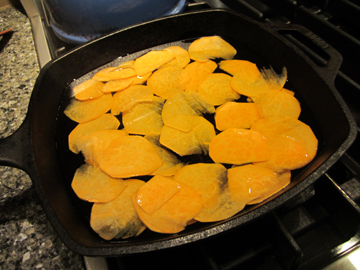 Place the pieces of sweet potato in a deep, heavy skillet or saucepan. Spread them out as much as you can. Cover them with oil; then add a little more oil. Place the pan on medium heat. Stay by the stove. In a few minutes the oil will begin to bubble. Stir the potato pieces a bit and keep heating them. As the potatoes cook stir them every minute or two to keep them from sticking together—and to monitor them. In a very few minutes they will brown and crisp up very quickly. Use a skimmer or tongs to remove the chips from the oil. (Don’t forget to turn off the stove!) Drain them on paper towels, and sprinkle salt on top. This entry was posted on Wednesday, January 29th, 2014 at 11:31 am	and is filed under Appetizers, Vegetables. You can follow any responses to this entry through the RSS 2.0 feed. You can leave a response, or trackback from your own site. This sounds delicious – doubly so since I can’t eat sour cream any more, but that doesn’t mean I can’t make it for my guests – on some occasion other that the Superb Owl because our friends got tired of explaining to Henry why people were cheering. We are not invited to anymore such parties. Mmmmm French Onion Dip, I was a bit skeptical at using the packaged brand too, and am so glad you made a great recipe for the real thing. Commonweeder, you have my sympathy both about the sour cream and about the Superb Owl. I watch it on my own in general so I don’t have to explain anything to anyone–or ask dumb questions. Loyce, I hope you enjoy making this! Sounds GOOD! Will try it! Please do–and let me know what you think! Can’t wait to try the dip recipe, because like you, I liked the onion soup/sour cream dip from my youth. However, with all the new information on the packaged ingredients, I had shied away from my old favorite dip. Plus, with your recipe, I can be more of a purist. My nutrition guru told me years ago not to eat anything I couldn’t pronounce and your recipe makes that possible. Thanks, Margie.